Situated next to the Farmer’s Market on Airline, coming here is like stepping back in time. Is it the 1950s? 60s? 70s? Yes, yes, and yes. Are you thinking it could be the 1980s in here? Afraid not. The place is full of lino floors and dark-wood paneling. 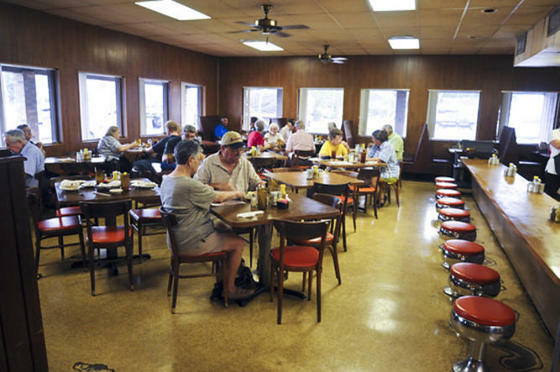 The patrons tend to be old-timers who’ve been coming here for decades. The waitresses are candidates for national treasures, with classic blue-green outfits, and the kind of sassiness you can’t pay for, no matter where you go. It’s just here, at Triple A for the cost of a tip. The regulars will tell you if you mind your best Southern manners you’ll be fine. Burgers are top-of-the-line: fresh patties made by hand, lovingly wrapped in wax paper. Pair it up with hand-made (yes!) onion rings and you’ll be a satisfied customer. Opt for the fries and you’ll be disappointed. So, do the onion rings! Chicken and dumplings are served ONLY on Thursdays and Saturdays but take the advice of local, Bernice (she’s an old Southern gal and sweet as Southern sweet tea), and go on Thursdays. It seems that they make all the dumplings for the week then and if they run low on Saturday, then too bad. They’re not making more until the following week. If you want all white meat chicken in your dish, you gotta tell your sassy server. Otherwise, you get a mix. The dish will come with rolls, cornbread, or both. You can have the “full meal” of the C-and-D plus 3 sides but you better be starving. The list of sides rotates according to what’s fresh at the Farmer’s Market next door. Don’t make the mistake of ordering the full meal; you probably won’t be able to finish it all, but doggy nags are avilable in a pinch. Most usually stick with and are completely satisfied with “just” the chicken and dumplings. They serve breakfast, too, if you’re there warly. Note that they close pretty early too – no later than 8:30 pm on any given day. The Triple A is family-owned and you’ll see different members manning the register. Sometimes, its the dad, sometimes mom, and other times it will be the college or high school kids. All will cheerfully ring you up and listen to your gripes or compliments. Okay, so the kids maybe not so much but let them know.